You can change the view of the patient follow-up list to have it display appointments to suit your preferences. View settings are saved until you log off. On the Schedule menu, click (or tap) Patient Follow-up. The Patient Follow-up page opens. The Patient Follow-up page provides the following viewing option. 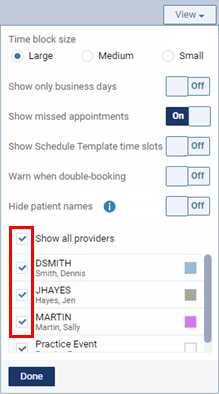 On the View menu, select or clear the check box of any providers to view or hide the corresponding appointments, and then click (or tap) Done.